No need to Eek! Or to Humph! 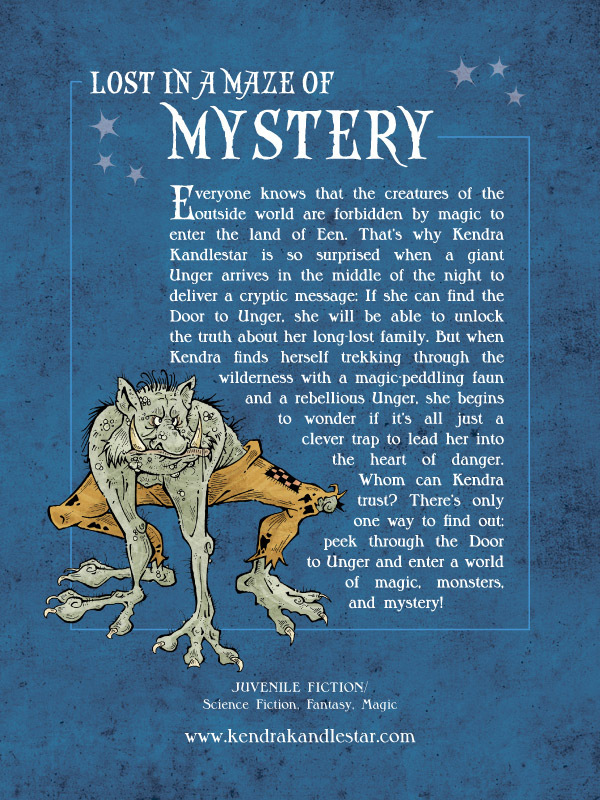 Or to get in a to-do—Kendra Kandlestar and the Box of Whispers is waiting for you! This is your last chance to take advantage of amazon’s promotion to download Kendra Kandlestar and the Box of Whispers for free! And be sure to “like” the amazon page and check out the other three Kindle editions of the series as well. Kendra Kandlestar contest: We have a winner! 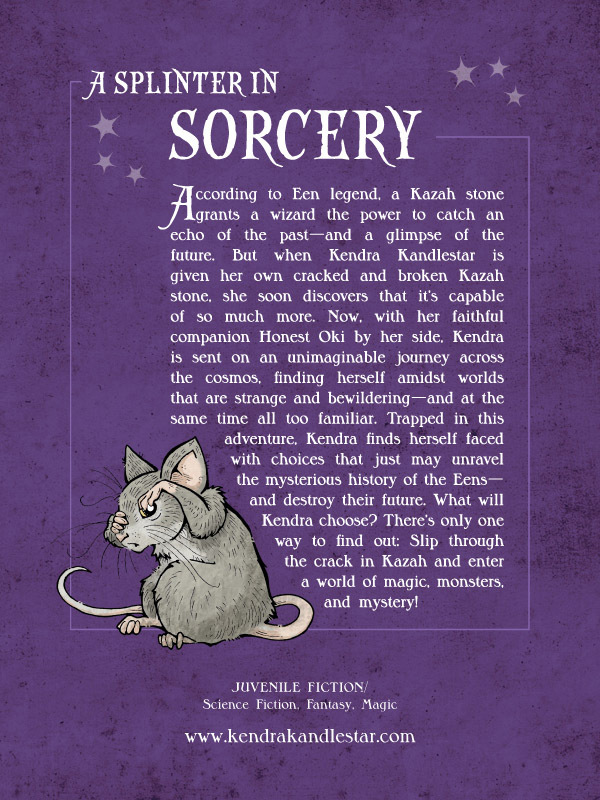 Congratulations to Emily, who submitted a question for the Kendra Kandlestar contest over at Ten Stories Up and won herself a Kendra Kandlestar prize-pack (all four books, plus some goodies!). Lindsey at Ten Stories Up has posted ALL the questions submitted, so it serves as a sort of interview about me and the Kendra Kandlestar series. So if you want to find out how I name my characters or see a picture of my studio . . . then head on over to Ten Stories Up! I may decide to use these covers for future print editions—what do YOU think? One thing about electronic editions of books is that they don’t have back covers. As a book designer I find this a bit disconcerting, like walking in the Shivering Wood without a torch. So last week I decided to design back covers to match my new fronts. Perhaps in a future update to the electronic editions I will add these. In the meantime YOU can look at them. And, perhaps, if we go with this new look for the next print run, then my work is already done! 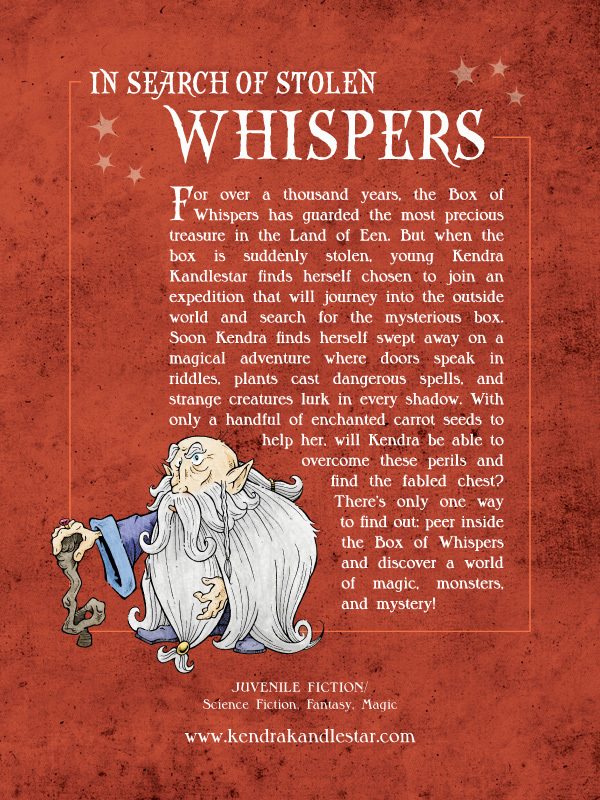 Well, only for this week—Amazon is running a promotion on Kendra Kandlestar and the Box of Whispers. Get your copy now! All four books currently in my Kendra Kandlestar series are now available through the Amazon Kindle store, featuring brand new cover art. I hope you like the new look! I have actually yet to write any scenes with this character—but I can’t wait to do so. I think she will be one of my favourite characters to develop for this book. 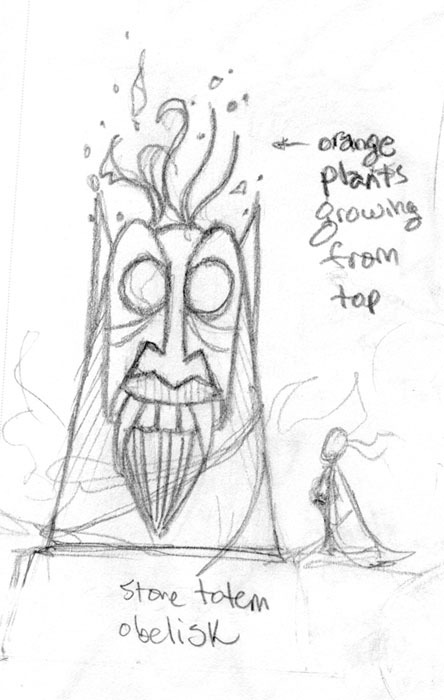 And when it comes to drawing, there’s no two ways about it; villains are just more fun! I am so proud of my creative writing students! 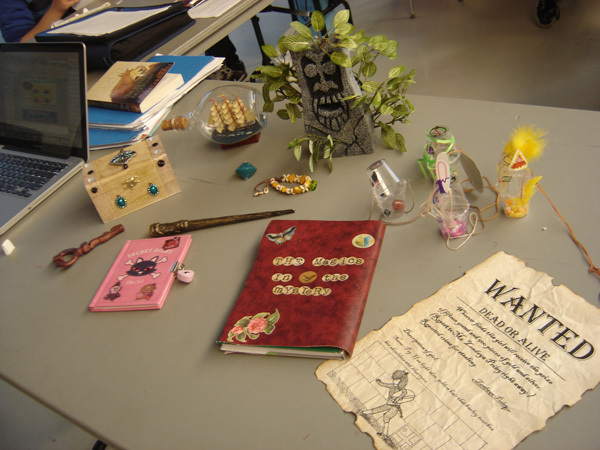 Yesterday they came to class with some absolutely wonderful props to go with their novels. I wasn’t sure if they would take this quest to heart, but they each were able to discover their own path to success. Some of them built their own props, while others went on a hunt to find the object. Others found an existing object and modified it. 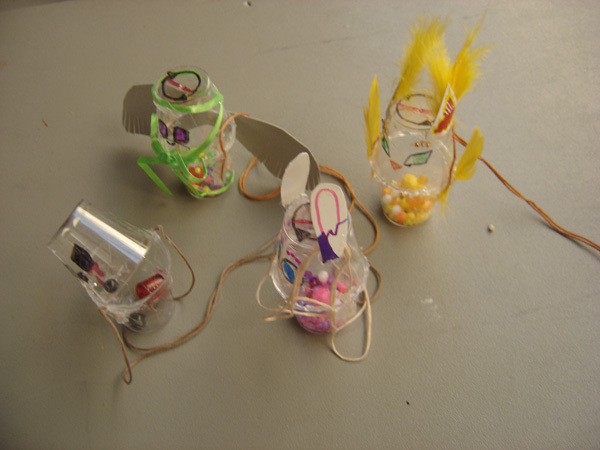 What I find interesting is that some students went to seek or build a specific object, while others found an object that inspired them enough to include in their stories. In either case, texture will be added to their novels. Their plots, characters, and settings will be enriched. Plus, I hope they had some fun—and let’s face it, writing needs to be fun. Here are some of the photos I snapped . . . This wand looked so fantastic that I at first thought Danny had actually bought it somewhere. 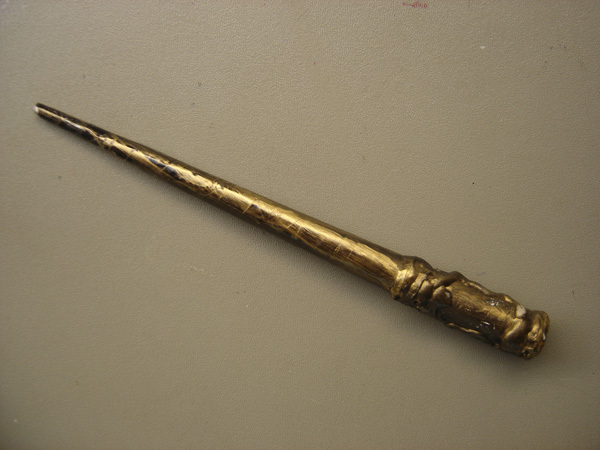 Turns out, he made it with a chopstick, some paper, gold paint and (the tool of all good prop-makers) a hot glue gun. 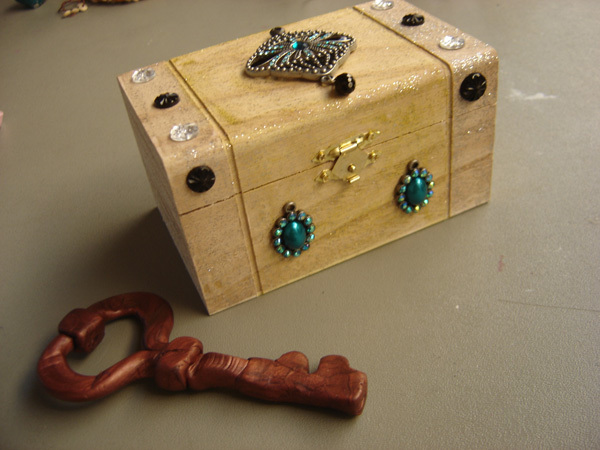 This student sought a magical key; when she couldn’t find the right one, she just built one of out clay. Then she decorated this box to be its container. Both were pretty amazing; I especially loved the ornamentation on the box. 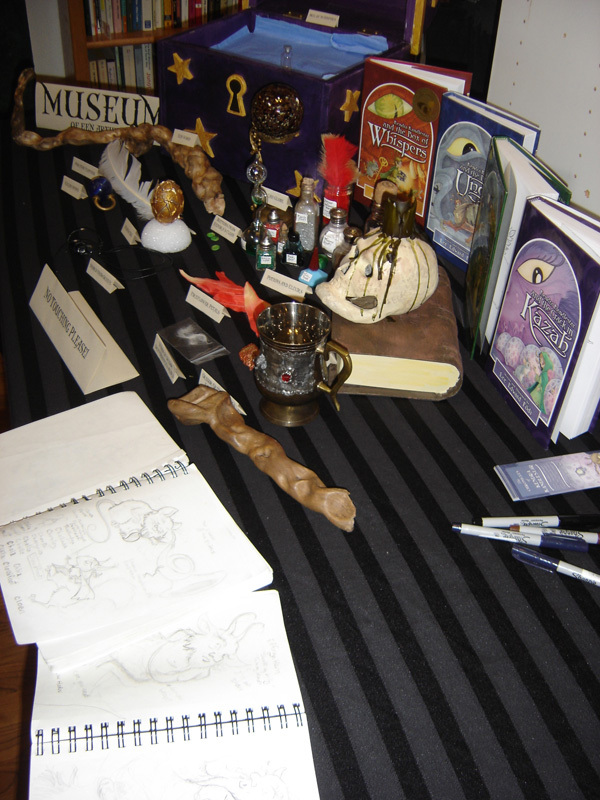 Below are some examples of props made from existing objects. 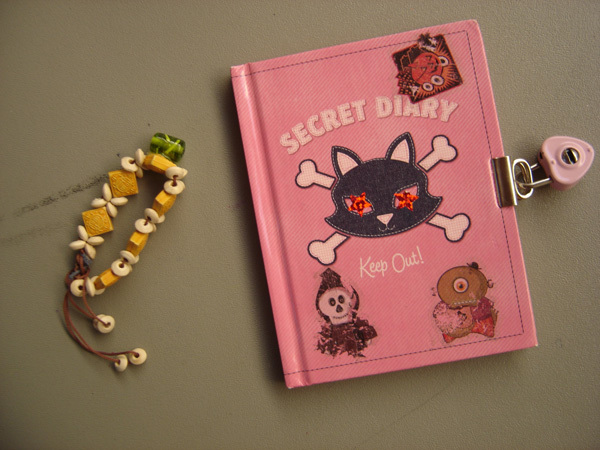 Amy took an existing bracelet and added a green “jewel” to it, while Michelle took an old diary from her past (complete with a lock busted by her brother!) and added some decorations to it. This diary prop is really important, as her whole novel is written in diary format. This is another prop that I thought was purchased, but upon closer inspection it was made. 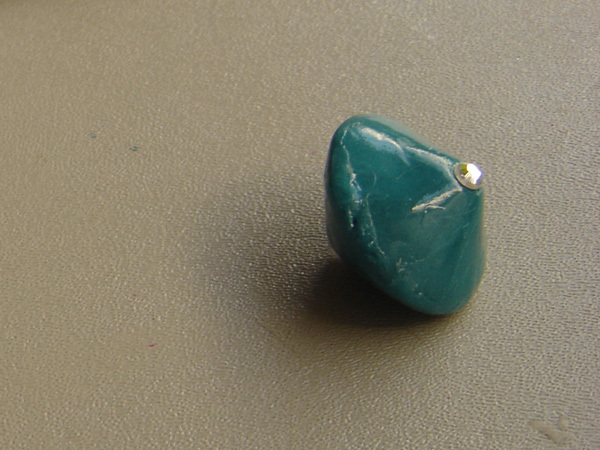 Sarah crafted it from clay and added some jewels to either end. This is definitely a magical device! 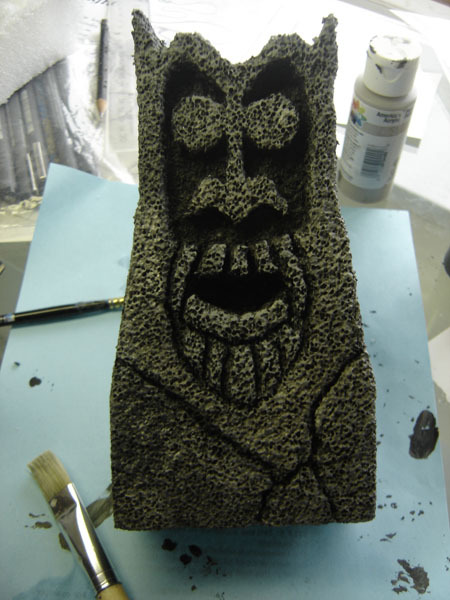 This is another handmade prop. 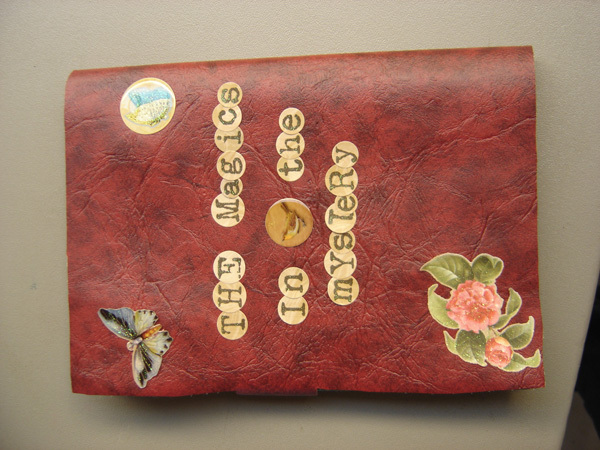 Rachael made the cover with a leather-like material and added all of the decorations. These props by Michelle were really interesting. They were little amulets that called forth a type of “familiar” in that shape. She even made a sample of what one looks like after it dies. 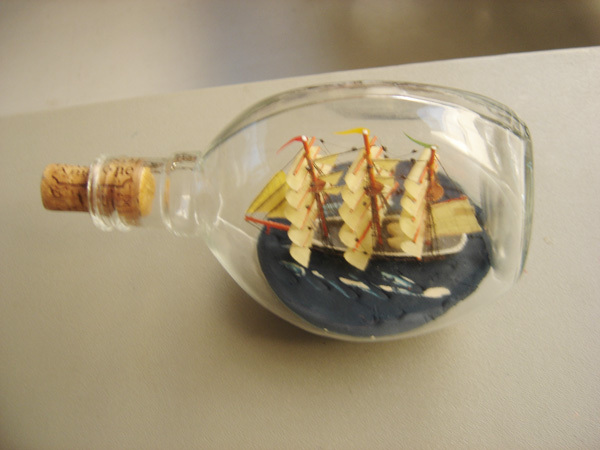 Jun’s hunt for inspiration led him to purchasing this boat in a bottle, which gave him a brand new idea for his novel. I can’t wait to see how this is incorporated! You never know where you’re going to find inspiration . . .
Just before spring break, I gave my creative writing students a task to find, build, or cannibalize an object that they could use to inspire them for the novels they are writing. Just to be fair, I gave myself the same homework. But I didn’t want to use any of my existing props for my homework assignment (wouldn’t that be cheating?). I made a plan to visit one of the local antique shops, which always are brimming with inspiration. 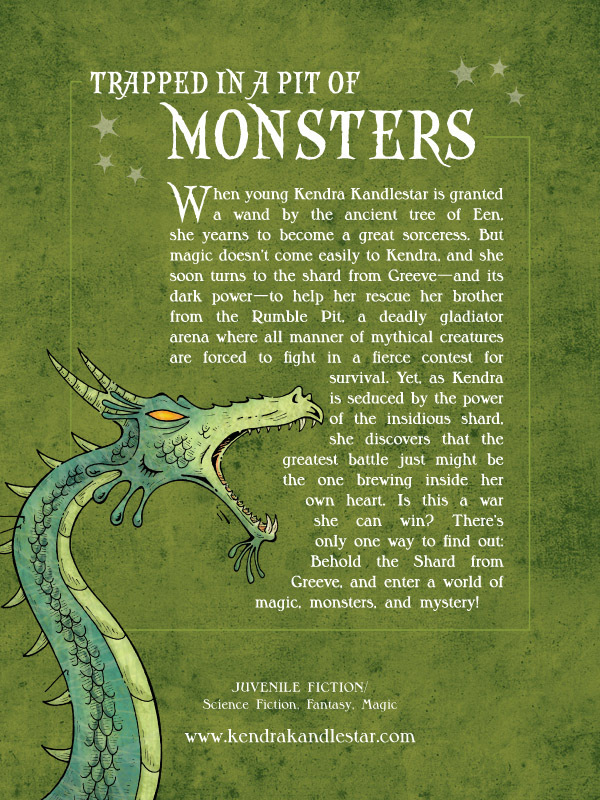 However, before I could get there, I found myself stuck on the latest version of my Kendra Kandlestar 5 manuscript. I needed something to provide a warning for Kendra and her crew as they journey through a dangerous jungle. 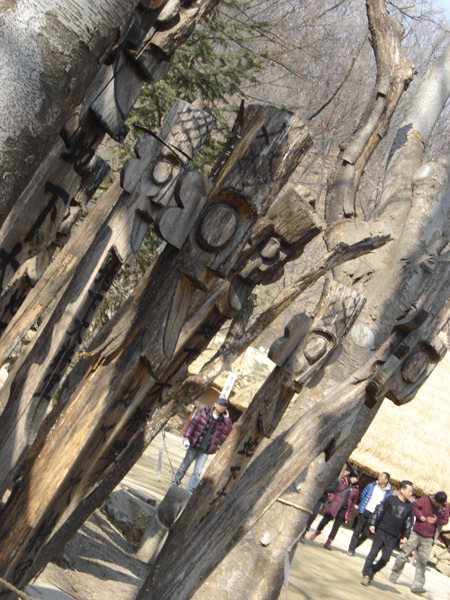 And then I remembered my recent trip to Korea and the interesting “guardians” I found at the entrance to a folk village. 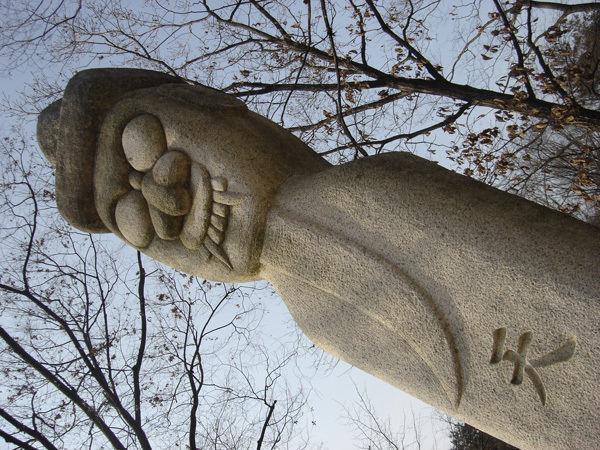 Called “jangseungs,” these totems are usually made of wood (though you can see one made of stone, below) and were meant to ward off demons. I was reminded of that great scene in Raiders of the Lost Ark when Indiana Jones is trekking through the jungle with his guides and the bats swarm out of a similar stone guardian. And anyone who has read Joseph Campbell’s writings on the hero’s mythological journey will be familiar with the term “Threshold Guardian.” A threshold guardian serves as that marker between worlds—the world the hero is leaving behind, and the strange, unfamiliar one he is about to enter. Of course, you see these threshold guardians all the time in western culture in the form of lions, dragons, or unicorns. They “guard” important or official buildings, or even homes.